Customers today don't just want to go shopping – they want a personalized shopping experience. How will you meet the increasingly sophisticated demands of your customers? The forward-looking solutions from LANCOM will do more than reduce your operating costs in the long term – you will also turn shopping into a unique digital experience that will delight your customers. Even today, networks from LANCOM give you a high-performance, cost-efficient basis for the retail applications of tomorrow – so your customers think of shopping as an experience. Customers will stay longer if they can enjoy a coffee in your bistro while checking their mails or going online with the help of your WLAN hotspot. They can login to the hotspot automatically via by e-mail or SMS - no staff required. Your customers will recognize the guest network as an advantage over your competitors. It is of course completely separated from the rest of your store's network, so your internal data remains secure. While your customers are online, you as the shop owner can distribute your latest advertising at an interval of your choice. Manually pasting price labels is time consuming, demands personnel, and it is error-prone as well. Electronic Shelf Labels are a state-of-the-art technology and offer far more convenience: Price changes, item descriptions, bar codes, and even QR codes are updated via radio. Central control over prices saves time and reduces stress. Even promotional offers can be implemented within minutes. More than 60% of Europeans use a smartphone, and the number is growing every day. That's good to know, because the smart phone is your customer's constant companion and can also work as your marketing assistant. For example, you can send your latest offerings to a customer's mobile phone. That's a real attention grabber and will boost your sales. Another way to achieve this is to optimize your sales floor with the help of visitor stream analysis. Find out more about the technology iBeacons. Today's customers are inspired by a modern and personalized shopping experience. For example, they appreciate customized advertising or discount offers sent directly to their smartphones. Providing a WLAN hotspot can also improve customer satisfaction. Are you ready for the new age? These days most people have come to rely upon free Internet access, so finding it at your store is a real plus. You can offer added value to your customers without extra work for your staff. Instead of using vouchers, logging in is easily done via e-mail or SMS, which customers can handle entirely by themselves. Your "Welcome to our WLAN" homepage is of course designed just the way you want it - with offers that motivate to buy. You can boost your sales by using customers' smart phones to address them directly and invite them into your store. For example, greet prospective customers in front of your store by sending them a discount coupon. This is an immediate incentive for them to visit your shop. Inside, you can send more offers to your customers’ smart phone. Modern technology offers you a multitude of options: Find out more about the technology iBeacons. You wish to give your customers detailed information about selected products? No problem. You can present your products and services on modern information displays that are easy and intuitive to use. Thanks to WLAN connectivity, you can position them anywhere in your store. The content such as presentations, news, or "Like" items can be managed centrally or locally at the store. Digital signage vividly communicates your product benefits and encourages your customers to buy. Mobile checkouts allow you to offer additional services and increase customer satisfaction. Your sales staff is empowered not only to handle the payment process but also to provide helpful information, such as the availability of products at other branches. Payment is by cash or by card. We of course observe the strict security standards for cashless payment transactions (PCI-DSS compliance). With electronic price tags, prices are adjusted wirelessly within minutes. This is just one example of how the innovative solutions from LANCOM can significantly optimize your workflows. In the future you can respond faster and more flexibly, and - on top of that - optimized processes sustainably reduce your operating costs. One solution – full integration. SD-Branch is the new, unique, and radically simplified way to manage your retail-chain network: Configure your entire network portfolio – routers, firewalls, access points, and switches – with state-of-the-art, software-defined networking technology for all network segments – WAN, LAN, WLAN, and security – with a single, cloud-based management system. The LANCOM Management Cloud uses software-defined networking technology to replace the time-consuming, manual configuration of individual in-store devices with higher-level network orchestration, all from a central site. Easily roll out, scale, and manage your chain stores and connect external service providers to your sites in just a few steps – that is the software-defined branch. You can effectively optimize in-store processes by implementing WLAN barcode scanners for order picking. This allows you to transmit data to the central ERP system in almost real time and will manage your inventories without error. Product reordering can be automated to make goods shortages a thing of the past. Our core portfolio is developed and manufactured in Germany, which is why you can have complete confidence in our award-winning portfolio of products for secure solutions "Made in Germany". Maximum protection of your data traffic is assured by high-security products certified by the BSI (German Federal Office for Information Security) and featuring our proprietary closed-source software. The secure integration of service providers is essential and thus a matter of course for us. EC and credit card payment transactions comply with strict security standards (PCI-DSS compliance). LANCOM gives you a holistic solution from a single source. Services include the professional WLAN planning for radio coverage without dead zones, the provision of complete network infrastructures along with roll-out and management tools, and also in-house support. Whatever you need - be it routers, access points, WLAN controllers, switches, antennas or cables - we provide you a comprehensive solution which is customized to meet your needs. As a LANCOM customer, you benefit from regular, free updates of our operating system family. This ensures that your network is always secure and up-to-date. If you are changing your business premises or you plan to connect additional stores, network infrastructures are easy and flexible to expand because all components are compatible with one another. Emerging technologies such as mobile payment or indoor navigation are easily integrated into your infrastructure. LANCOM solutions make you fit for the future. For technical questions or problems of any kind, we offer support straight from the manufacturer. We provide fast help and information by phone or e-mail, even at the pre-sales stage. A specially trained team of field application engineers takes care of your problems on-site. Whatever kind of support you need - we are there for you. Our network of experts guarantees that you can rely on local support from certified LANCOM partners. 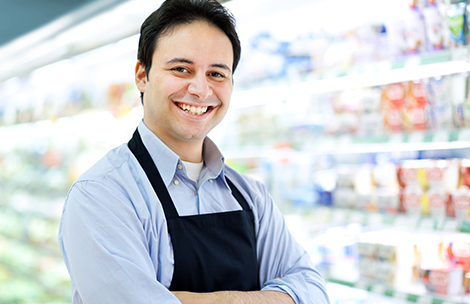 You can rest assured that every one of your stores has a competent contact person close by. We also cooperate with numerous strategic partners, who provide tools and solutions that perfectly complement our portfolio. Your benefit: Tailor-made solutions and great service. All-IP migration of 80 branches throughout Germany to IP-based connections. In order to ensure a smooth transition from ISDN to All-IP, companies have to deal with the migration at an early stage and develop a strategy. The fashion chain liberty woman from Lübbecke faced exactly this challenge in 2016. New cash register system brings modern network technology into more than 390 Kamps bakeries around Germany. As the Netherland’s largest non-food retailer the Blokker Holding B.V. uses centrally controlled and future-proof Wi-Fi networks for customers and employees. With the implementation of a stable and futur-proof Wi-Fi, MARC O´POLO brings RFID-readers and other applications in their 111 own stores. NOMOS Glashütte today is a world-famous watch manufacturer with about 250 employees. For optimization of their production they rely on network components "Made in Germany". The OLYMP Bezner GmbH Co. KG insists upon uncompromising quality and service for its products. The same applies to the wireless communication in their logistics and administration. As a market-leading retailer of fashion jewelry and fashion accessories in Europe, the Bijou Brigitte group operates a network of more than 1,150 stores in different countries. Shoppers in Bavaria and Baden-Wurttemberg know TTL/TTM chain of stores as specialists for flooring, walls and windows. A wide-area branch network ensures rapid and secure data transfer between the 90 locations. This retailer operates one of the largest WLAN and VPN networks in Europe. More than 25,000 access points and 6,000 VPN routers are optimizing the logistics and inventory management at the REWE Group. The shipping and logistics center in Bocholt is the linchpin of the shipping company Rose Versand. Paperless order picking optimized by WLAN has enhanced and accelerated the processing of orders. Branch-office connectivity takes digital applications to the stores of the 1-Euro discounter TEDi. Along with the remote maintenance of checkout systems, sales figures can be retrieved over a VPN connection. Strong partners support us. And you! Partnerships have always taken a high priority at LANCOM. Together with selected partners, we develop and supply outstanding infrastructure solutions for the retail sector, helping our customers on their way to success. We also have strategic partners who provide a wide range of tools and solutions that complement our products to perfection. "Retail Analytics - Utilise the power of Wifi-Analytics to steer your store network. Capture potential, plan your marketing budget efficiently, and benefit from data-driven decision making. 42reports Retail Analytics is your central planning tool for a successful store network." "Location-based targeted marketing and customer analytics by Bitplaces enable modern retailers to implement an intelligent multi-channel stategy!" "Based on our dynamic 3D indoor maps we provide people orientation in larger building complexes. This way, we facilitate everyday life and optimize business processes at the same time. A win-win for everybody!" "Location-based services cater for an interactive customer loyalty - directly at the point of sale! With WLAN as the foundation, movement analyses, indoor navigation, and multi-channel solutions can be realized." "Motionlogic is developing models for data analysis."